I agree – I just feel sad and scared for my son. Yeah having a teenage son I can’t help but think what this says about his life and how people might perceive him and react to him. We had hoped we wouldn’t still have to worry about these things in 2013, but we obviously still do. I had my own thoughts on the case, and while the verdict was unsurprising it didn’t make it any less maddening. I have a link if you’re at all interested. Would be more encouraging for those of us looking in on the U.S, if justice was served. The more things change, the more they stay the same. Would love to get the link. Thanks. Thanks for the link. And your art is great. Thanks a lot, you’re welcome. The media, Al Sharpton, and the likes made this case about race when it wasn’t, and all the liberals and the black community followed suit. The media blew this whole story out of proportion for good ratings, and several people ended up losing their jobs over it. Zimmerman was labeled a racist and a murderer before any of the facts came out. People didn’t even know he was a minority! The evidence clearly shows it was a case of self-defense with a very unfortunate ending. Have you even bothered to listen to or read the evidence from the trial? Probably not. Case closed and rightfully so. It looks like you yourself are ignoring facts that don’t fit with your version of truth. And one thing I have learned over the years is that it is a waste of time arguing with someone who chooses selective ignorance. But regardless of which “version of truth” you choose, doesn’t change the fact that a child is dead. Which, to most compassionate humans, is sad no matter what. I don’t think anyone would disagree that Trayvon Martin’s death is tragic. At the same time, I don’t think a man should go to prison for the rest of his life for murder when he’s not a murderer. I’ve read all of the evidence from both sides and watched hours and hours of the trial. I feel really sorry for everyone intimately involved and angry at the media and other people who have propagated rumors and false information and have passed judgement before knowing the facts. 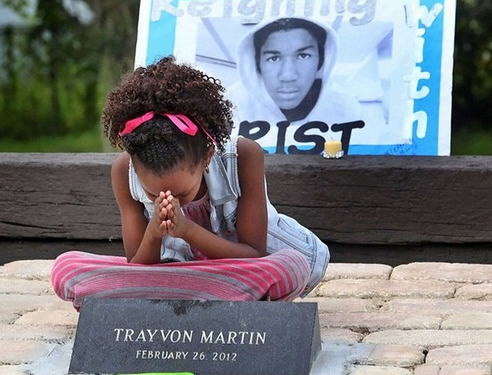 Trayvon Martin is the only one who ended up dead, but many more lives have been destroyed by this case. Please tell me which facts prove to you that George Zimmerman is guilty of murder beyond a reasonable doubt. I’m interested to hear. Out of curiosity where did you read that I thought Zimmerman was guilt beyond a reasonable doubt? My sadness over this whole case is not based on whether under the letter of Florida law Zimmerman should have received a not guilty verdict in this criminal trial. I think only two people really can ever say for sure what happened that night, and one of them can’t speak anymore or defend himself. My sadness is focused on the system or law that even rightfully under the law would allow a grown man to follow and shoot an unarmed teen who himself may have been scared and reacted, even over-reacted possibly in self-defense, and when he was winning the fight, could rightfully be shot. My sadness is that the message, especially to young blacks whether you believe that is a factor or not, is don’t fight when someone is trailing you suspiciously, even if you are scared. And definitely don’t win the fight. At least in the state of Florida. What no one denies is that Trayon might still be alive today had he not been seen as a suspect for walking home that night. As a black father with a teenage son, I’m not sure how to help someone see how scary and sad that fact is. Well, Anon, there is a gun; a dead teenaged kid who was unarmed and not commiting a crime; and an armed shooter who pursued him despite being told not to by police (AKA the people who are supposed to be stopping crime). Fortunately, it was “just a black kid in a hoodie” who died, so no crime was committed. I guess. Meanwhile, a lot of onlookers seem to think it was a football game or something. They are cheering for “Team Zimmerman” instead of recognizing that everyone loses in this scenario. Totally agree my friend. It is a terrible case for so so many reasons. I think we all lose a bit as citizens, no matter which opinion one takes of the case. That to me is what true tragedy is. The title of this post is “The Zimmerman verdict makes me more sad than anything,” which I think it’s reasonable to conclude means that you disagree with the verdict and think that Zimmerman should’ve been convicted of murder. I agree with most of what you said, but I just don’t see it as a black vs. white issue. I think it could’ve been a white teenager just as easily. In the 911 recordings, Zimmerman wasn’t even sure of Trayvon Martin’s race initially. I completely agree with ericjbaker that everyone loses in this scenario. Well glad you understand a bit more of where my sadness comes from. And the only problem I have with your statement that it could just as easily have been a white teenager is that there is nothing in news anywhere that supports the case that white unarmed teens are just as likely to be shot as black unarmed teens. That is just not true. No amount of my wishing that to be true, that people don’t see black teens as more of a threat, makes it true. If you haven’t seen this video I posted about a while back please watch it to see the difference how the general public perceives black teens versus white teens. It may open your eyes. Would love to hear your thoughts on it. I appreciate your civil discussion on this and for reading the blog. I never said I don’t think racial profiling exists. I know that it does. I lived in Miami for a few years and worked at the county hospital in downtown. My very first evening shift, I was unknowingly followed after work by two young black men. I had the instincts to run when I realized they had followed me into the parking garage. I made it out of the parking garage to the main road before they caught up with me, tackled me to the ground, and stole my purse and ran. I always felt it would’ve ended worse had I not made it out of the parking garage to a more public place before they caught up with me. For awhile after this happened, I was weary of young black men I ran into on the streets. I know racial profiling exists, because I’ve been guilty of it myself. The thing I disagree with here is that I don’t think Trayvon Martin’s death was a race issue until the media and people like Al Sharpton made it that. On whether Zimmerman profiled Martin that night we will have to disagree about. Because again we only have his word. And things he has said in his past indicate he has issues with minorities, even other Hispanics. But I appreciate your honesty in telling that story. No doubt we all profile sometimes. And thanks for the link to the video. Very interesting. I understand your sadness. This recent verdict has caused a lot of confusion and disillusion. I personally was not surprised by the verdict. I told many of my family and friends that Zimmerman would walk away a free man. If you watched any of the trial you’ll notice that Zimmerman never looked worried at all. His father is a judge(I’m sure that helped). Also I heard the jury consisted of one latina woman and five white women. I don’t think any of these women felt any empathy for Trayvon. I also know how the media tried to criminalize Trayvon before the trial even started. Like America does most black men today.The deck was stacked against him from the start. After knowing all this there was NO way Zimmerman was going to jail for murder or even manslaughter. If you know the history of the “criminal” justice system—you now how it treats black people. I definitely understand why folks are angry. But I think a few things should be addressed though. 1. Trayvon was not engaged in any crime (i.e. attempting to break into someone’s home) when he was accosted by Zimmerman. He was simply walking while black, wearing a hoody (in the rain, at night) with a cell phone, a bag of candy, and a soda. How does that make him suspicious or threatening? 2. Zimmerman automatically assumed that Trayvon was up to no good. Why? There had been previous break-ins, in the community, by one or more black guys. This was Zimmerman’s Suspicious Individual formula. This is called racial profiling. Zimmerman was the aggressor, not Trayvon. 4. Zimmerman never identified himself, to Trayvon, as a member of the Neighborhood Block Watch. 5. Zimmerman is not a cop. 6. Trayvon had every right to defend himself against a perceived threat in a ‘Stand Your Ground’ state. Some of us find some whites to be very threatening. I guess this never occurs to whites. What is not being stated by many is that whites are allowed to defend themselves (with impunity) against a real or perceived threat but blacks aren’t. – Marissa Alexander, a black woman, received 20 years in prison for defending herself (firing a warning shot) against an abusive husband. The husband was unharmed because she did not point the gun at him. This happened in the ‘Stand Your Ground’ state of Florida. – John White, black, who shot an enraged white teen (part of a rabid white mob) on his property (in New York), was convicted of manslaughter for defending his home and family from a rabid white mob. – John Horn, white, shot and killed two black men (in Texas) for robbing his neighbor’s house. This man admitted that he was out to kill these black men who were not on his property and were not engaged in a violent act. Horn received zero jail time. The obvious pattern is being ignored by man people. The double standard is painfully obvious to me. I think black folks need to take off the rose-colored glasses. America has showed us time and time again what it thinks of us. We are viewed as sub-human and worthless.When are we going to wake up? All the interracial daring/marriage,integration, school busing and biracial babies hasn’t gotten us any better treatment. This verdict was our Emmitt Till wake up call. The question is: How many of us woke up? I definitely hear you. And one thing is clear, we are definitely not post racial just yet as a society. @Kushite Prince, there are so many inaccuracies in your comment, but I’ll mention just a few of them. The Retreat at Twin Lakes isn’t a “white” community. It’s very much a multi-ethnic community. Zimmerman isn’t white either. He’s a mixed-race Hispanic. So many inaccuracies?? Okay if you say so.lol The truth is I know the history of this country and how racism operates. I’m not going to let someone tell me my own experience is a lie. Everything I said I still stand by it. Peace. So you just fabricate facts and stand by them? You just make up that Trayvon Martin was shot in a “white” community when he wasn’t and stand by it? You just make up that the two men shot and killed by Joe Horn were black and stand by it? I don’t get it? Also, John White was initially sentenced to 2-4 years for shooting and killing the teenager, but was then pardoned after serving only 6 months. I presume though that you don’t care about the facts here either. @Kushite Prince, you’re as bad as the media in your fabrication of facts to support your personal agenda.